Grill pans can be a great alternative to the barbecue or char-broiling especially when you don’t have access to wood chips, charcoal, or a yard. 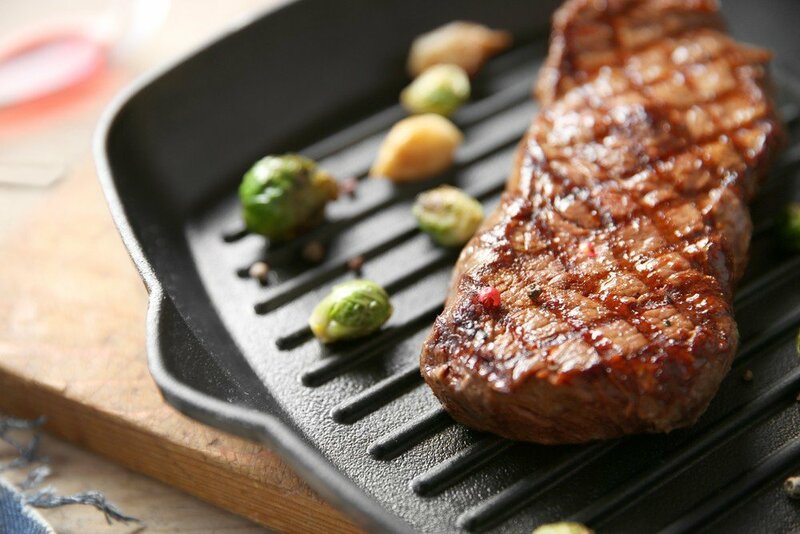 So, if you’re a condo or apartment dweller longing for al fresco cooking, a grill pan will emulate that outdoor cooking experience complete with the characteristic grill marks you’d typically have a real grill. Apparently, though, both cast iron and non-stick grill pans can become difficult to clean and care for if you don’t properly maintain them. 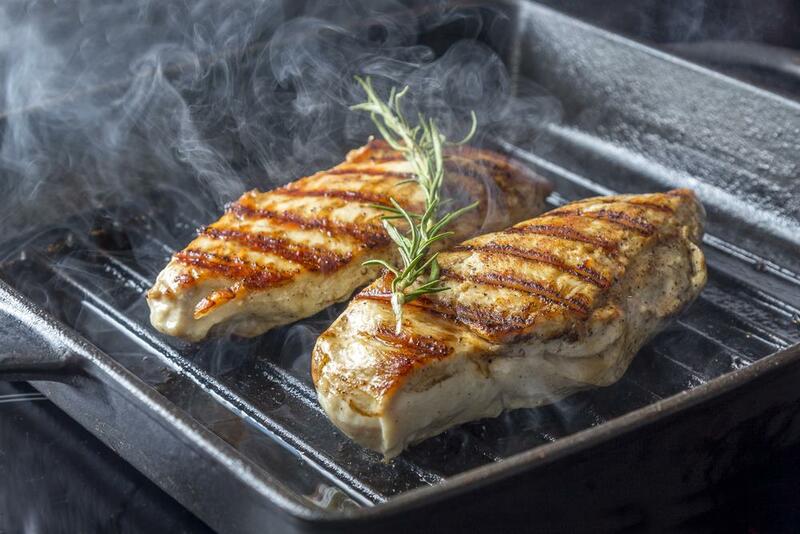 Similar to any other pan, food may at times stick to a grill pan’s surface. 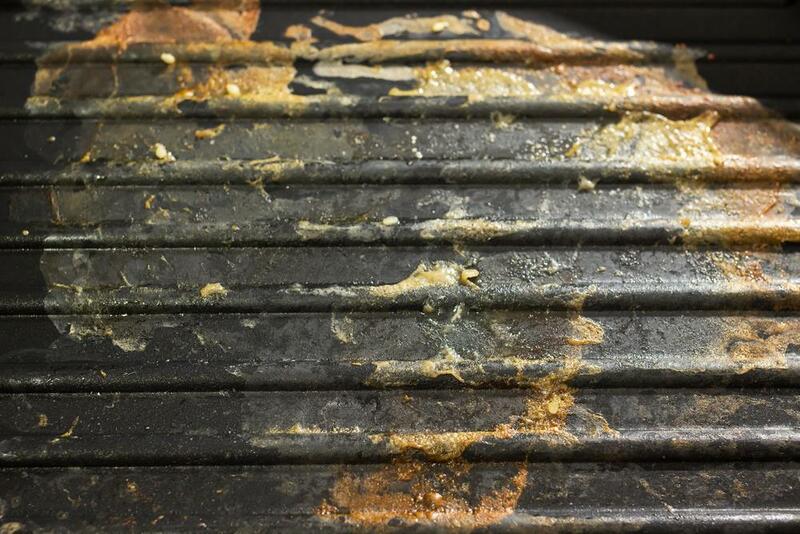 Grill marks then compound this problem as oil and residue may collect along the ridges or grooves. So, how to clean a grill pan? Don’t just reach for the nearest clump of steel wool since improper and severe scrubbing may damage your pan’s coating, whether it’s cast iron or non-stick. 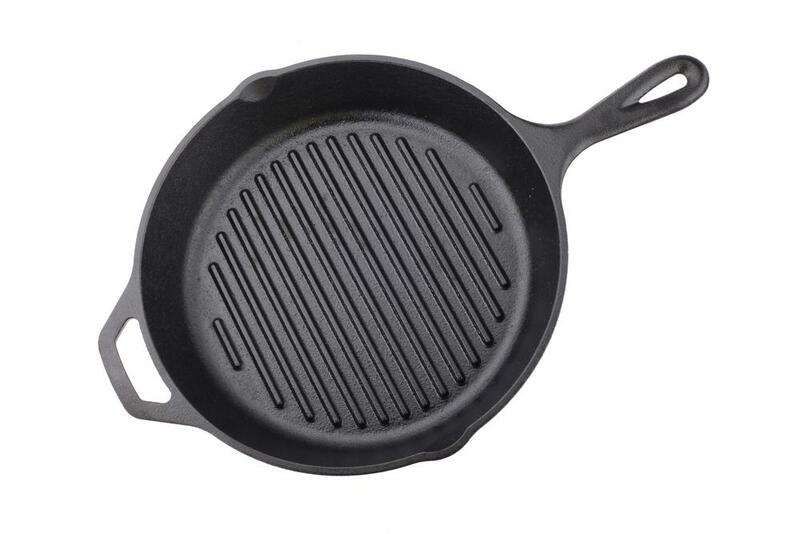 Hence, in this article, we’ll look at the tools and ﻿﻿cleaning gear you’ll need to properly clean a cast iron grill pan as well as the non-stick variety. Afterward, you’ll find different methods on how to clean a grill pan with the tools you have while also keeping these cooking equipment in tip-top shape. Apparently, Grill pans that cast iron or non-stick, like Teflon, will require different methods of cleaning. Hence, we’ll take go into what you’ll need to clean both types of grill pans (or Red Copper Pan). We’ll look at two easy methods to remove the crusted food residue off your grill pans. You’ll see that both these methods will be effective for a cast iron pan. However, for a nonstick pan coated with Teflon or similar nonstick coatings, method two will be best. There are several effective methods for cleaning a ﻿﻿﻿cas﻿t﻿﻿﻿ ﻿iron﻿﻿﻿ ﻿﻿﻿﻿﻿﻿grill﻿﻿ pan. You’d be happy to see that most of the things you’ll be using are already in your kitchen. However, regardless of the method you choose, a cast iron pan will need re-seasoning, most especially after a substantial cleanup. Hence, I’ve also included steps on how you can season your cast iron once you clean it of residue. The most common way of cleaning a cast iron grill pan involves the use of salt to scrub down those pesky food and oil residue. Also, this method would be perfect for cleaning pans that you have just used and are still hot. Salt, preferably Kosher or salt that is coarsely-grained. After cooking, remove excess oil from the pain by either pouring the grease into the trash or wiping with absorbent paper towels. Additionally, avoid pouring cooking oil down your drain as this can eventually clog your pipes. While the pan is still hot, pour a generous amount of salt and a dash of warm water on the entire surface of the grill pan. Also, Kosher or coarsely-grained salt would be best for cleaning due to their bigger flakes. Carefully rub your pan’s surface of the pan using paper towels or a thick napkin. The paper towels will absorb any leftover oils and fluids while the salt flakes will help take off the crusty debris. Use several paper towels and more salt depending on the amount of residue on the pan. After you remove all the food bits, clean your cast iron grill pan with warm water. Afterward, make sure to thoroughly dry the grill pan with paper towels or by setting the pan over a stove on low heat. Conversely, don’t let a cast iron pan air dry or leave it wet as this can lead to corrosion. Keep your cast iron rust-free and non stick by re-seasoning the cooking surface. Hence, be sure to check our quick seasoning guide after the different methods on how to clean a cast iron grill pan. 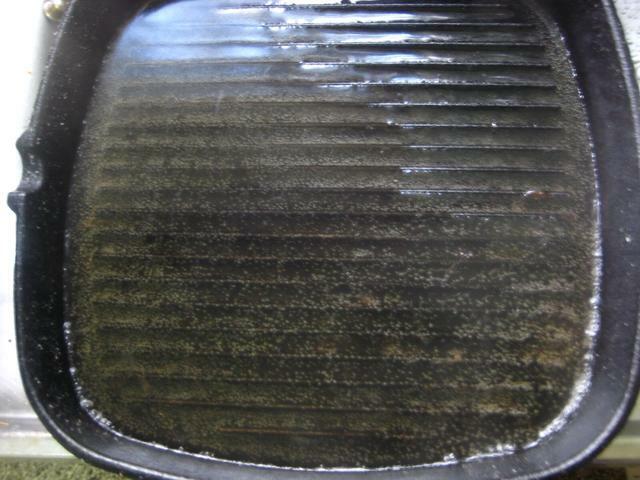 Another way for you to clean your cast iron grill pan of residue is with boiling water and vinegar. Moreover, this method would be perfect for crusted pans that have not been adequately cleaned and has since been in storage as well as pans with nonstick coatings. Pour about half an inch of water coupled with a splash of vinegar to your grill pan. Place the pan with the vinegar solution on the stove over medium heat and let it simmer. Then, the hot water and vinegar will soften the crusts of grease or food on the pan. When the water and vinegar solution gets hot enough to simmer, you can start gently scrubbing the food residue off the pan. Also, never use a steel spatula with a nonstick pan as this may scrape of its coating. Lastly, clean the pan with warm water to wash away the food residue and the vinegar. Afterward, dry thoroughly to avoid corrosion. Always remember to wash with warm water since cold water may lead to warping. Additionally, at this point, you should reseason a cast iron grill pan. As you may already know, seasoning refers to the layers of oil that build up on the surface of a cast iron pan. Like all cast iron pots and pans, you’ll need to routinely re-season their surfaces to keep them rust-free and nonstick. After thoroughly drying your cast iron pan, add a small amount of cooking or shortening to the pan, just enough for you to coat the entire surface. By remembering these practical cleaning methods and regularly maintaining your grill pans, you’ll be able to make delicious food with those appetizing grill marks for a long time! Not only will proper maintenance extend the lifespan of your pans, but it will also keep your meals tasting excellent!